When a pirate attacks a ship, he finds seven children, survivors from that attack, stowed away on his own ship and he must figure out what to do with them. Dir: Alexander Mackendrick Cast: Anthony Quinn , James Coburn , Dennis Price . Time Out called it "pure cinema and pure entertainment, with comedy and tragedy ironically balanced in the combination of childhood dreams and adult dread." I hope they show it again, since I'll be busy tomorrow, and not confident in my ability to record it properly. Here are the TCM premieres for September, as determined by MovieCollectorOH’s report published on August 4. Note that TCM is continuing the premiere showings of the 1935 Tailspin Tommy serial on Saturdays along with selected cartoons, so these are listed separately. Thanks as always to MCOH! A male Parisian driving school owner who goes to see his doctor and complains of feeling run down is pronounced four months pregnant. When the diagnosis is confirmed by a specialist, the result is an international media frenzy. Dir: Jacques Demy Cast: Catherine Deneuve , Marcello Mastroianni , Micheline Presle . Dir: Ettore Scola Cast: Marcello Mastroianni , Monica Vitti , Giancarlo Giannini . Viewer Beware!!! (at least for the first one)........Someone report back, please. I'm NOT gonna watch! Well it looks like it was "castles in the air." Assuming you're okay with the movie being spoiled, he wasn't actually pregnant. If you REALLY want to see that theme, I suggest 1978's Rabbit Test with Billy Crystal, directed by Joan Rivers! What's the story behind the "rabbit test", anyway? Was that a real medical thing or just an urban myth? If a rabbit died, you knew you were pregnant? What kind of Theodoric Barber of York medieval medicine was that? How did that even work? Did PETA ever protest this procedure? I need information! 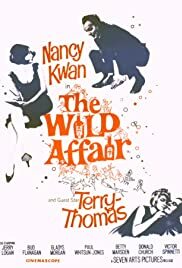 Because of the recent schedule change to provide a memorial tribute to Neil Simon on the evening of September 14, the TCM premiere showing of The Wild Affair (1965) has been cancelled. The list of September premieres in the message above has been modified to reflect the revised schedule. This came up in another thread. I forget which one. It's a British film. Terry Thomas in a supporting role was the only cast member I'd ever heard of. Oh, well, I've heard of some of those people! I can't read that tiny little print in black at the bottom of the poster when it's that size on my laptop. I can't read it either, but it's the only one I found. I'm not sure how much either Bessie Love or Frank Finlay are in the movie, as they were far down in the credits. Synopsis: A dying man reluctantly takes on a job as a hit man in order to have money to leave to his widow. Dir: Wim Wenders Cast: Bruno Ganz , Dennis Hopper , Lisa Kreuzer . Oh, wow, I would love to check this out, but very unlikely I will be up at that time. If I think about it, I'll record it. Henpecked Hoboes (1946) has already aired on Cartoon Alley episode 35. I have Sports Slants #1 in my collection so I have to assume that has aired before as well. Mon., 9-3 for AFI Tribute: George Clooney..
A convict escapes a chain gang to stop his wife from remarrying. Dir: Joel Coen Cast: George Clooney , Tim Blake Nelson , John Turturro . A corporate efficiency expert lives his life in airplanes, airports, hotels and rental cars. Faced with the prospect, at once terrifying and exhilarating, of being grounded, he begins to contemplate what it might actually mean to have a home. Dir: Jason Reitman Cast: George Clooney , Vera Farmiga , Anna Kendrick . I see that it is available on WATCH TCM ON-DEMAND for the next seven days. Updates to my project are uploaded. This was a small update, only three months (Aug, Sept, Oct), usually I do four or sometimes even five at a time. If they come out with new months before...let's say the middle of the month...then I "may" retroactively apply those (in other words just add the new months, not rework any existing). Re The American Friend -- I recorded it and started to watch it yesterday, but I just couldn't stay with it. I think my biggest problem was Dennis Hopper, who isn't my idea of Tom Ripley. Patricia Highsmith is one of my favorite writers, and I've read all of the Ripley books and have a definite mental picture of what Ripley would be like. Strictly my own conception, of course. For me, the preppy types who have played him, such as Matt Damon, Anthony Perkins, and even Alain Delon, fit the image a lot better than Hopper. Also, I don't particularly care for Hopper to begin with. I do like Bruno Ganz, though. I did some reading on the movie, and learned that at first viewing, Patricia Highsmith didn't like it either, but she saw it more than once, and began to like it more. This is saying something, because Highsmith was one of the most difficult people to ever walk the earth. So I'm glad it's on demand now. I'll try to get through it with a more open mind. A mercenary group falls prey to dark forces after parachuting into an eerie cornfield.